15*30 grid. Two different colored pinnies. Balls with servers on the sides. One small gate set up on each end line. Markers set up 5 yards from each end line. Four players on each end line. Can adjust numbers where needed. Each group of players is numbered 1-4. Server will call out two numbers and the players from each team with those numbers compete 2v2. Defenders can win the ball and attack the opponent&apos;s goal. 1. Nearest defender to the ball pressures as the ball travels to the attacker. 2. Speed and angle of approach of the first defender. Show inside where cover is. 3. Slow down and show restraint. 4. Covering player - proper angle and distance. 6. Proper cues to press - bad touch, bad pass, negative play, attacker facing own goal, etc. Servers become active by supporting the team in possession. Allow for 1-2 touches. 1. Where do we force the attacker? 2. What happens when the ball switches attackers? 3. What happens when the attackers choose to run with the ball? Quarter field - OSC set up. Two large goals. Two cones15 yards from goal on each end line (from both goals). Three teams of 5 players. 6v6 on the field with GKs. Two teams work; one team rests. Rotate every 3 minutes. Normal game - regular rules. Only condition is as the ball goes to the GK, two of the red team must run into the end zone marked by the cones on the touchlines. As the GK transitions the ball, blue look to attack with at least a possibe 4v3, creating an overload where the defending team are outnumbered. 1. Delay - slow down the attack if the ball cannot be won. 3. Dropping defenders need to be ball side/goal side (form narrow triangle with ball). 4. Speed and angles of approach - espeically for recovering defenders. Progression: remove conditions and play a regular game. 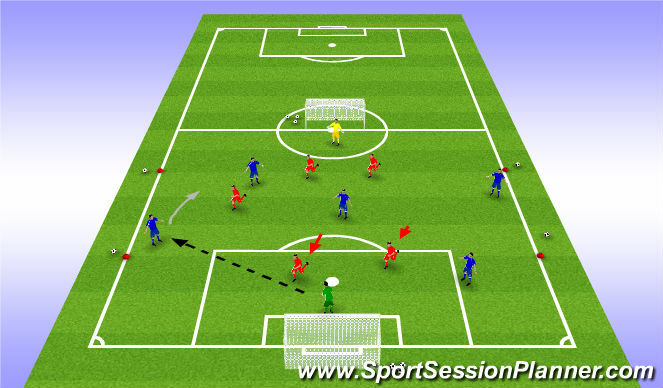 Can the delay defenders force a wide pass in front of them amongst the attackers? Can the ball be won? If not, now what? What if the point of the attack is changed, how does this affect the recovery runs?